What is advanced rider training? 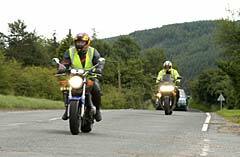 We are pleased to be able to offer the Advanced Rider Training to all levels. Our advanced instructors hold the RoADA Diploma in Advanced Riding Instruction, and are happy to assist with any further training you may require, from cornering to advanced test training and anything in between. Your training, though a very serious matter is also meant to be fun. By adhering to what you have been taught, you should be able to enjoy many years of safe and pleasurable motorcycling.